A recent Nature Climate Change paper by Erickson and Lazarus concludes that KXL may produce incremental emissions of 0-110 million tonnes of CO2per year, but the article has provoked some controversy. 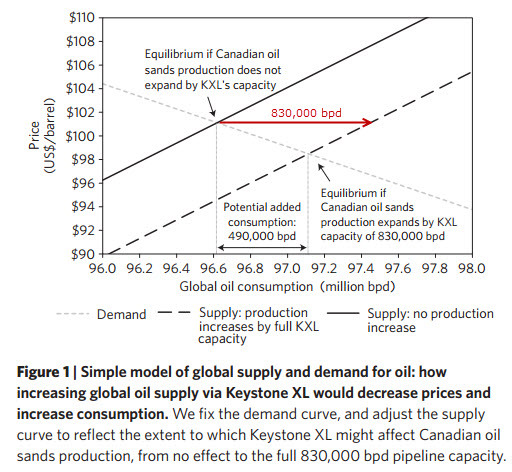 Erickson and Lazarus (E&L) use a simple economic model to estimate the effect of adding 830,000 bpd of bitumen to world oil markets. Other things being equal—but with oil they rarely are, see later—increased supply will lead to lower prices and those lower prices will lead to lower supply and higher demand, until the market clears. This is illustrated in the graph from their paper, below (I added the red arrow and text). The supply curve (sloping up to the right) is shifted rightwards by the extra 830,000 barrels of oil per day, which is the capacity of the KXL pipe. Production falls elsewhere by 340,000 barrels to meet the demand curve (which slopes up to left). 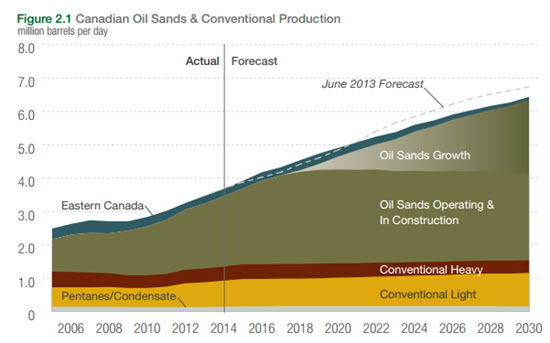 The additional supply of oil sands oil effectively adds a net 490,000 barrels of supply to the market. This is a ratio of 0.59 extra barrels consumed for every additional barrel supplied. Demand increases as prices fall by about $3 per barrel. As should be obvious, everything in this analysis depends on the slopes of those curves (they are actually here, of course, straight lines and the gradients are related to “elasticity“: the more elastic the demand or supply, the flatter the lines). E&L considered different estimates of elasticities for supply and demand, sourced from published surveys and an OECD review. They found from this sensitivity analysis that the variation in the 0.59 ratio figure (global consumption increase divided by oil sands production increase) ranged from 0.08 to 0.78. If it is assumed that the construction of KXL results in an additional 830,000 barrels per day of bitumen on the world market, then the extra global emissions due to pipeline are in the range of 100-110 MtCO2/year, an amount about halfway between the State Department’s and Abraham’s estimates. On the other hand, if the pipeline only carries product that otherwise would have been shipped by other means, the incremental impact would be zero. There has probably not been a single opinion expressed on the KXL project that has not been hotly disputed and E&L’s paper is no exception. Energy economist Michael Levi[link] has made three criticisms. First, he disputes their assumption of perfect world markets in oil that make the problem amenable to simple modelling, pointing to the still strong influence of OPEC and other large state producers. Second, he challenges the supply elasticity assumption E&L have made, arguing that the estimate is highly uncertain and that the uncertainty range on the low elasticity side is too low. See the graph below. Source A simplified version of this curve can be found in E&L’sSupplementary Information. The red circle (added) marks the assumed equilibrium price at a consumption level of 96.62 mbpd in 2020. Finally, Levi raises questions about the effect that KXL will have on oil sands production. At lower oil prices, at which the extra cost of rail transport would have an impact on the profitability, the supply curve would also be flatter, diminishing effects of additional production on prices and demand. As a result, and depending on the extent to which the pipeline leads to greater oil sands production, the net annual impact of Keystone XL could range from virtually none to 110 million tons CO2 equivalent annually. Energy economist Andrew Leach also discusses the economics of the rail option in the context of the E&L study. He points out that the oil sands development proponents assure us that the economics of the rail option are robust, even if this adds a few dollars per barrel to the costs. However, the same proponents often claim that carbon pricing that would add a few cents per barrel would threaten the competitivity of the oil sands. For example, see this article by journalist Aaron Wherry. Moreover, Dave Sawyer of IISD points out that the cost of doubling Alberta’s current carbon tax would add the cost of a Timbit (left as a Googling exercise for the non-Canadian reader), about 13 cents per barrel, yet even the introduction of this small extra fee is contested by industry lobbyists and by politicians and is unlikely to be introduced. Even though E&L’s model has provoked some harsh criticism, it is the only peer-reviewed article that attempts to model an important consequence of one of the most contested environmental decisions in North America. The onus is surely on their critics to provide a better model. A criticism of my own is that, in the particular case of KXL, there will not be 830,000 barrels per day of additional bitumen delivered to markets. (E&L used 830,000 bpd to facilitate direct comparison with the State Dept numbers.) The fluid in the pipeline will be diluted bitumen, which will be about 25% light oil or condensate. This fluid will be separated out at the refinery and will be recycled or used for other purposes and shouldnot be considered as new oil put on the market as a result of the pipeline. The maximum emissions that KXL could be responsible for in E&L’s analysis would therefore be in the range of 75-80 Mt CO2/year. It is worth noting that E&L’s calculation that an extra supply of 830,000 bpd will produce a commodity price drop of $3 per barrel is at odds with claims of many opponents of the pipeline, who assert that the increased oil sands production will make no difference at the gas pumps. KXL is only part of the oil sands expansion story. According to the Canadian Association of Petroleum Producers, production will grow by about four times the amount of the volume of KXL. If E&L’s methodology is to be accepted, this would cause a world crude price drop of $12 per barrel. My personal assessment is that by applying incremental analysis methods the additional emissions resulting from the construction of KXL will more likely be in the lower half of E&L’s range of 0-110 M t CO2/yr. This is in part due to the supply elasticity concerns raised by Levi, the role of transportation alternatives recognized by everyone, and a reduction of about 25% due to the diluent content of the fluid in the pipeline. Nevertheless, I think that the issue can be looked at in an entirely different way, one that can allow us to consider that the emissions impact of a KXL approval could even be bigger than the carbon that might flow through the pipe. Climate scientist Ray Pierrehumbert points out that for long-lived greenhouse gases likeCO2, what matters is the cumulative amount emitted. The timing of emission has almost no effect on the ultimate warming effect and the climatic consequences will persist for many thousands of years. Deferring emissions for a few decades brings us almost no benefit. As many scientists (e.g. Allen et al. 2009) have noted, we have a limited carbon emissions budget of about 1 trillion tonnes of carbon if we want to keep warming under a 2°C target. Bill McKibben has written about how humans have already used up about half of that budget and that we have already identified (and booked) many more fossil fuel reserves than that budget will allow us to consume. (See also this SEI Discussion Brief by Michael Lazarus.) As the mantra goes: we have to keep most of the reserves in the ground. Not only do we have to keep the reserves in the ground, but we have a massive fossil fuel resource base and we need to stop converting those resources into reserves, since once we have done that it gets even tougher to keep them in the ground. Modified from Swart and Weaver, 2012. More details here. Under any emissions pathway it is almost certain that conventional oil reserves will be produced and consumed. My calculations of the cumulative oil used between 2010 and 2100 for the low-emissions, stay-under-2°C, RCP 2.6 scenario (van Vuuren et al., 2012) is approximately 7800 exajoules (EJ) (approximately 1.4 trillion barrels) Using thereserves estimates for 2005 of Rogner et al. (2012) and adjusting for consumption over 2005-2010, there are as of 2010 approximately 7800-12,000 EJ of conventional and unconventional oil reserves remaining. (In addition to that that there are additional oilresources of more than twice that size.) 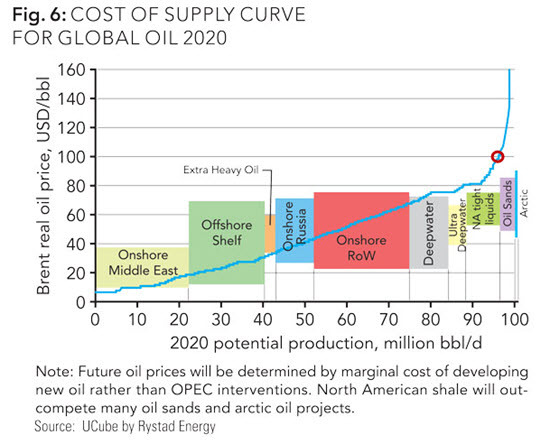 Therefore, even in the most aggressivemitigation scenario, we appear likely to use up all of the current lower-bound estimate of oil reserves. Undeveloped unconventional resources, such as the oil sands, are capital-intensive and the economics of new projects are vulnerable to future carbon pricing policies. Established projects with sunk capital will be less vulnerable. If we are to leave carbon resources in the ground, it follows that we should not be encouraging the capital investment that will make it more likely that those resources become reserves and, eventually, emissions. Although transportation infrastructure, like pipelines, is not the biggest capital investment in the development process, it is a crucial one. They did not call the pipeline “Keystone” by accident. Proponents of the pipeline often argue that the oil sands crude will find a way to market, regardless of the presence or absence of any single piece of infrastructure. That’s arguably true in certain scenarios. Proponents may also claim (as in the State Department report) that invisible hands will take production of lower-cost conventional oil off the market to compensate for the extra bitumen supply. That’s also possible. But it is hardly consistent to claim that bitumen will inevitably find its way to market when voluntarily withheld developed and more profitable conventional oil will not eventually find its way to a refinery. That withheld production is for all practical purposes deferred, not cancelled. And as we have seen, it doesn’t matter much from a climate-change standpoint when the emissions occur. Economics cares a lot about when, cummulative emissions much less so. Because of this, it may not matter if production from oil sands projects is offset by immediate reductions in conventional production elsewhere. Over the longer term, that withheld oil will be almost certainly be produced anyway and Abraham’s emissions estimates may turn out to be close to the mark. Looking only at short and medium-term impacts on a project-by-project basis is an inadequate way to plan for the cumulative global effects of our energy supply. This point was also made in a recent Nature comment by Palen et al (2013). A recent paper by Davis and Socolow (2014) argues that policy makers would be better informed if they adopted a “commitment accounting” method to estimate the cumulative effects of new fossil fuel investments. The massive capital investments required to start an oil sands production operation are of such a size that they are not—even for the biggest companies—everyday business decisions. Instead, they are strategic moves that could make or break a corporation for decades to come, and they are decisions made in the presence of deep uncertainty. The big multinational oil company Total recently made the decision to shelve its $11 billion Joslyn bitumen mine project indefinitely. We need not doubt that their publiclystated reason that the costs were too high really was a crucial factor. (That admission, incidentally, rather undermines the argument that oil sands project economics are robust at current prices of $100 per barrel and can comfortably withstand a few extra costs, such as shipping by rail.) However, it is likely that the boardroom discussion pondered other unquantifiable risks, for example: where is the crude oil price headed; what will the light crude/bitumen price spread be; will the price of natural gas rise; how big will carbon pricing be when it is introduced, if ever, and how hard will it hit global demand? There is also the uncertainty over future demand for bitumen from its biggest export market, the United States. Cancelling Keystone XL would be an important signal that the USA neither wants nor needs any more of Canada’s bitumen. If the Joslyn project is never revived, a lot of bitumen will remain in the ground. Total estimated that the mine would produce 160,000 barrels per day. That would take up (allowing for diluent) about one quarter of the capacity of KXL and, using John Abraham’s figures, that would lead to saved emissions of around 50 million tonnes of carbon per year. Perhaps the uncertainty over new pipelines can take some of the credit (or blame) for that. Nobody knows, of course, nor can we know what other new projects may be canceled or indefinitely deferred because of doubts about transportation infrastructure. Northern Gateway and TransMountain, the two pipeline projects that aim to access ports on the Pacific Ocean, face serious legal obstacles and determined local opposition. Pipeline projects to Eastern Canada refineries and ports are planned, but, if the slow and uncertain progress of the other pipelines is a guide, nobody should be expecting them to be completed on schedule, if they are built at all. A CEO of a big bitumen producer is reported as saying that his company needs “every major pipeline project on the drawing board, along with rail, to allow it to transport its growing oil sands production”. He won’t be getting them all. Proponents of the development of the oil sands like to point out that expanding the exploitation of the resource will provide significant local economic benefits to Alberta and Canada, while having little effect on global emissions. (Of course, they never frame the benefits in relation to the global economy and they avoid any mention of the significant effect on Canada’s future emissions.) It is true that even the highest emissions estimates associated with the KXL pipeline make up not even 1% of global emissions. But it is nevertheless significant beyond its size, not only for climate activists as an achievable objective to rally around, but also as a signpost for nervous potential investors in new oil sands projects. The ultimate impact of the KXL decision on the trajectory of climate change could be far bigger than any calculations of its incremental or even its total committed emissions might suggest. Allen, Myles R., et al. “Warming caused by cumulative carbon emissions towards the trillionth tonne.” Nature 458.7242 (2009): 1163-1166. Davis, Steven J. and Robert H. Socolow. “Commitment accounting of CO2 emissions” Environ. Res. Lett. 9 (2014) 084018 (9pp). Erickson, Peter, and Michael Lazarus. “Impact of the Keystone XL pipeline on global oil markets and greenhouse gas emissions.” Nature Climate Change(2014). Palen, Wendy J, et al. “Energy: Consider the global impacts of oil pipelines.” Nature 510 (2014) 465–467. Pierrehumbert, R. T. “Cumulative Carbon and Just Allocation of the Global Carbon Commons.” Chi. J. Int’l L. 13 (2012): 527. Rogner, Hans-Holger, et al. “Energy resources and potentials.” Global Energy Assessment (GEA), Cambridge University Press, New York (2012): 425-512. Swart, Neil C., and Andrew J. Weaver. 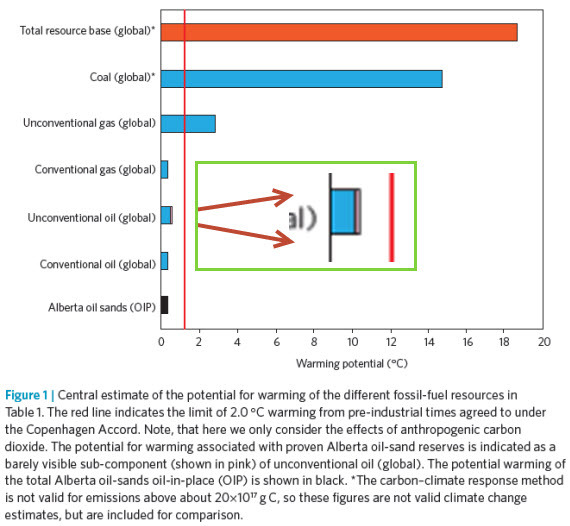 “The Alberta oil sands and climate.”Nature Climate Change 2.3 (2012): 134-136. Van Vuuren, Detlef P., et al. “RCP2. 6: exploring the possibility to keep global mean temperature increase below 2 C.” Climatic Change 109.1-2 (2011): 95-116. This entry was posted in Hard Science and tagged Economics, Keystone XL, Oil Sands, Politics. Bookmark the permalink.